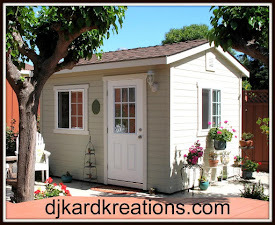 We had a beautiful weekend, but now rain and hail are falling again, which is unusually late in the year for us. Since winter seems to be hanging on and spewing snow in a lot of areas this spring, I went winter all the way with my cards today! And critters all the way, too, although they are not identical. First up is a NBUS chicken that just karacks me up! She reminds me of Jackie Gleason. Now some of you are prolly too young to remember who Jackie Gleason was, but he was a really funny man who had his own TV show back in the middle of the last century. He was a large man, but quite light on his feet. If you want to see a video of him dancing with his pal Art Carney, go here. But I digest. Jackie Chickie is from Stampingbella. The oval vellum ice is from Sizzix and the NBUS "Oh Joy" is from Mama Elephant. She is watercolored with my Ziggies, winked all over, and her Santa hat fur is glitterized. ABC Christmas: "H" is for Hat or "I" is for Ice. I managed to pull Hammy away from all the becitement happening over at the Twofer challenge, but he wants me to remind you that there is only one more week to play! I got his attention once I explained that he would once again star in his own segment on the blog. I think I have created a (ham)monster. 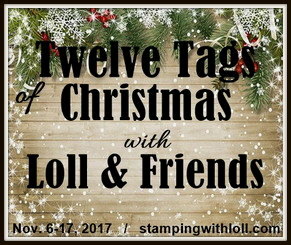 This adorable heat-embossed stamp is from Whimsy Stamps, colored with my Ziggies. From the look on his face, you might think Hammy was a little nervous up there riding on the ornament but he was only saying how chilly he was. That's why I sewed long sleeves and pants into his jacket. The NBUS Merry Christmas die is from MFT and the border is Washi. Of course, as always, everything is winked, glittered, and glossified! You can see it better here when I turn the card to capture the sunlight. In spite of my cards, it IS spring, so I'll leave you with a photo of my rain-drenched irises. They came up strong and proud in spite of all the hard knocks Mother Nature put them through! Fabulous cards Darnell and beautiful irises too. Hammy on the ornament is a bit worried :D but so lovely, great sparkling and glossing on him! Great works! 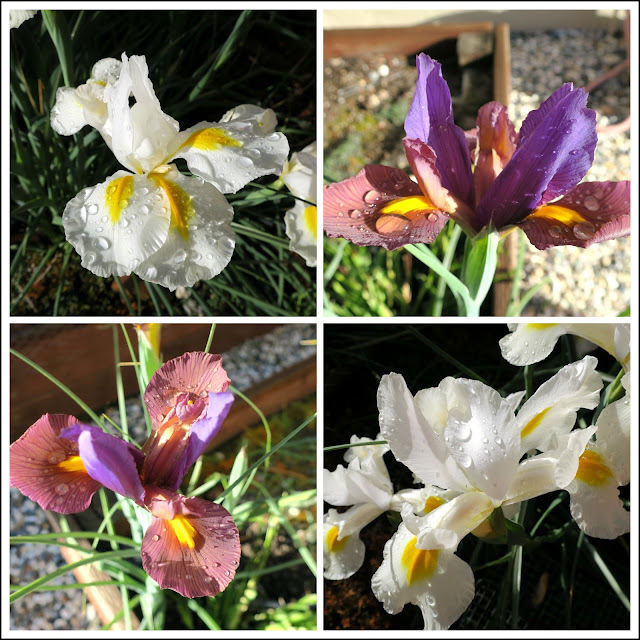 Your irises look amazing with the raindrops! So glad Hammy is being useful and earning his bikkies or what ever he eats... As well as enjoying his swing on the glittering ornament!! That chickie cracks me up too - it's adorable (but don't tell Hammy that)! Fabulous cards, so fun and creative..gotta love them critters!! Your Iris are beautiful, too, my daffodils are hanging their little heads in the ice/snow, poor things, I wish for just one year they could actually live!! Cute cards!! 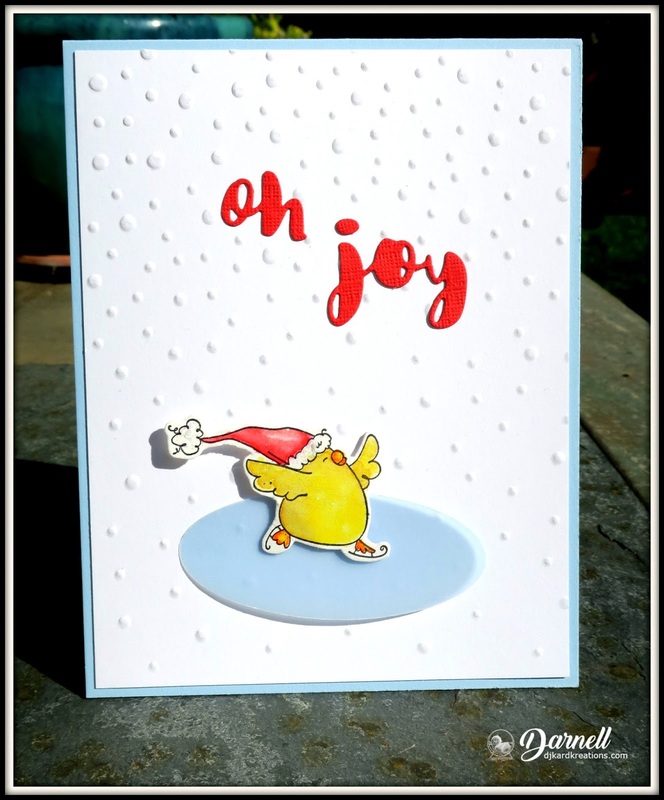 Love the chicken on your first card! Your irises are beautiful!! Mother Nature is sure dealing out some rough justice with her weather antics isn't she? So happy your irises are weathering the storms! They are beautiful. Your cards are so fun! I really like your humorous take on cards. They are light and bright and so fun. That Hammy on the ornament cracks me up. Thanks so much for sharing! Hugs! Very cute winter cards with the sweet critters! The mouse hanging onto the bulb made me smile, so fun! And, your iris photos are so pretty! We woke up to snow on the ground here. But, warmer temps next week, yeah! To the moon, Alice, to the moon! Younger stampers won't know where to go with that sentence. I love the look on Hammy's face as he rides the ornament. So fun and both cards are cute. Love the ice skating Jackie Chickie, he is adorable. Your flowers are so pretty and hardy for sure. I love that chickie...and I do remember. Your hammy looks like he having a wild ride. Your iris' are beautiful Darnell, thanks so much for sharing. Your Christmas cards are adorable! Love that dot background and cute chick. And that mouse is adorable set off with gold accents! Of course, I remember Jackie Gleason, Art Carney and Audrey Meadows...but I forgot who played Trudy. This, obviously, was one of my favorite shows of all time. Loved Jackie and Art in dramatic roles, as well. Back to cards. Super adorable CAS chick on ice. You are so stinkin' clever. And that mouse on the ornament is everything a Christmas card should be, fun, sparkly and cute. Another twofer for Christmas...I'm impressed that you're building your stash already. My stack is nowhere near as high as yours. I've been seeing some Iris on the walks with Fritz, but none as gorgeous as yours, Darnell! Hopefully we're getting a break from the rain after today--lots of dry days predicted. Your Christmas cards are darling! Love that neat Washi & the sentiment die cuts are beautiful! 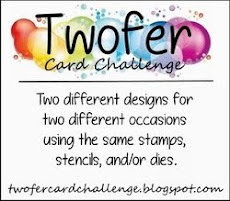 Both cards are great and the second is very matching for our Challenge this week @ Little Red Wagon. Thanks for joining us !! ps. your irises look beautiful. This card is 100% joy! I love her and how you used all the elements. Huge creativity! Beautiful irises (one of my favourite flowers!) and two great cards. Especially the second one with the adorable Hammy swinging on an ornament - wouldn't he just love to do that on your Christmas tree! I had to laugh when you said everything was "glossified" - years ago, the young daughters of a friend used to love to help me groom my dog and were intrigued by the different brushes and combs I had to cope with her long coat. I told them that the brush we used last was to make her coat glossy so from then on, they called that brush the "glossening" brush - I've never forgotten that great word! Forgot to say, thank you so much for joining us at both CAS Watercolour and CAS Christmas! Two fabulous cards, that little chick looks so proud to be skating on the ice and the hamster looks quite shocked to be hanging from the bauble. I have heard of Jack Gleeson and Art Carney (maybe I should not admit to it ) but I have just recently discovered Foster Brooks and he cracks me up. Hope you and the Mister are both well. I'm glad you picked pets for the Twofer challenge, Darnell, because there are some awfully cute ones out there including the chicken and the hamster that you so beautifully displayed on your cards. Maybe the younger generation would remember Jackie from Smokey and the Bandit but I also know the older version. To the moon, Alice. Adorable Christmas card designs. I do agree...that chick does look like Jackie Gleason strolling across the room. But both of the cards are fantastic. I love your gorgeous flowers too. I do remember Jackie Gleason, Dolly, but I don't think I was old enough to stay up and watch his shows. Your big/little yellow chick is adorable on the skating rink! Looks like fun! And I love Hammy swinging on that Christmas ball! That looks like fun too! Love his little suit! 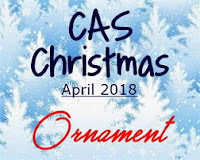 Thanks for sharing with us at CAS Watercolour and CAS Christmas! I'll be over with my TwoFer as soon as I get a pic! Such fabulous cards, Darnell! Love both, especially the chicken and your comparison to Jackie Gleason! Seriously, you should write a book! You have a captivating way with words! Beautiful irises! One of my favorite flowers! Hugs! I just love these Bella chicks (how did I miss this one) and right off I thought of Ralph Kramden (did you know that Amazon prime video has some of the earliest eps of the Honeymooners, back when the spot was just a 15 min segment, with different Alice & Trixie? - not great quality but I enjoyed seeing these as I'd never seen the real early ones). Brilliant to use vellum ice too. And I loved the expression on Hammy's face. Yes, I thought he was thinking how cold it was, too, so I'm glad you gave him some clothes! Your iris are lovely....we have a few purple ones that have blossomed. That white one is just stunning too! TFS & hugs. Prayers too. Two fabulous cards! I absolutely adore the kitty card...too cute! Your cards are awesome, your irises are gorgeous. Thanks for that peek at Spring. We haven't seen her at all around here - still more than a foot of snow on the ground. Also, thanks for the reminder about the Twofer Challenge. I need to get moving on that!!! Great (and really cute) cards! And thanks for sharing the great video! 2 excellent cards and such super designs. The expressions on both are delightful and so cute. I do hope you had a safty net for Hammy on that Christmas bauble. LOL!!!!! Love the broder on the second one too. Oh what fabulous cards!! 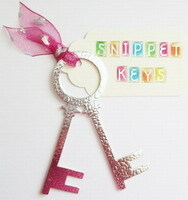 That Whimsy image is so cute!! Your iris are spectacular even with rain! Seems we are not the only ones to have had a long winter... It's warmer today but the sun is hiding somewhere... probably ashamed to show his face seeing as how he's been off on a very long holiday somewhere and it wasn't Majorca! Lol! Have a good day! Adorable cards--love your little critters! I can definitely see JG in your fun chick. Took some time to watch the video and it brought back many memories. TV was full of mainly happy entertainment at one time! Tell Hammy I loved his card too! What happy cards today, and I do love happy! I certainly do remember Jackie Gleason. He was quite the twinkle toes, but Art Carney was the real hoofer. I still watch reruns of The Honeymooners. You're doing a great job getting ahead with your Christmas cards. So cute all winked and glittered and glossified! Your irises are gorgeous! Such a welcome sight, aren't they? We're having some rare sun today so I'd better go out and look at my spring flowers while there is some sparkle on the leftover raindrops. Thanks for the smiles today, Darnell! Hi Darnell, two fabulous cards, I love the little critters, and your designs and colours are super. Such darling and cheery cards! Love your adorable wintry critter cards. They are so cute. Of course the sparkly and glittery just adds that special touch. Oh yes I remember watching Jackie Gleason. Dates us doesn’t it? Love your critters especially the one on the ornament. Lov the shimmer and the fur. No iris flowers here yet. Mine are trying but that is about all. As always love your twofers. 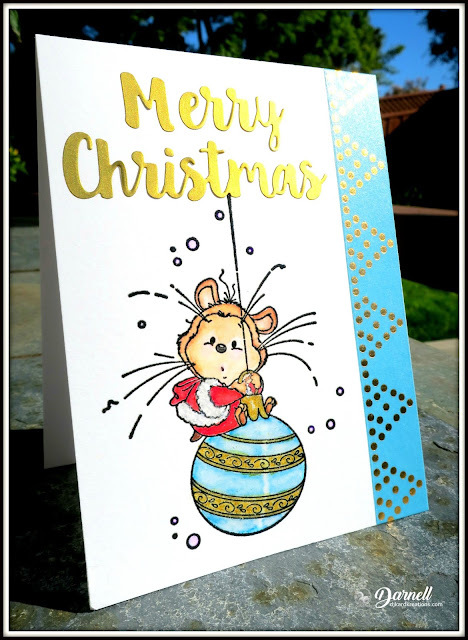 I love your fun Christmas cards Darnell and you're right - Hammy does look terrified to be swinging up in the air like that! Everything is beautifully coloured as always, and isn't it great to have 2 more cards in the Christmas pile? I hope you and the family are well and enjoying the belated spring. I am happy to report that finally today the sun is shining here and it is around 50ºF as opposed to 35ºF only yesterday! The next two days are supposed to be even warmer so we are starting to hope the Spring is here to stay. Jeepers are these ever CUTE Darnell!! That little bird looks like she is having a grand ol' time! Thanks for the beautiful glimpse of spring, just wish ours would get serious about sticking around! Adorable critter Christmas cards, Darnell! Adorable mouse on the ornament with some festive sparkle. 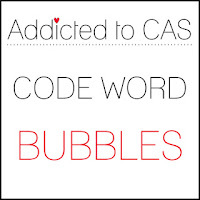 Glad you shared it at CAS Christmas. Wow great cards what a clever way to use the codeword. Thanks for joi ing us over at ATCAS. Love both these cards Darnell but ohh that chicken the first one, just perfect.